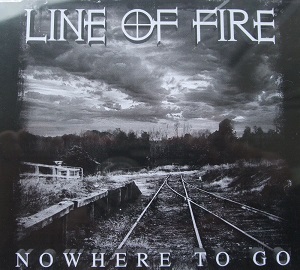 East Midlands band Line of Fire are back with their second EP, Nowhere to go. Playing some down and dirty Southern metal they are a band that are definitely worth a listen. The more observant of you may notice that one of the band members (Paddy O’Malley) is a member of Lawnmower Deth, but don’t let that put you off as this EP reveals that he’s been hiding a secret for all these years – despite the frequent claims from Lawnmower Deth that they can’t play more than 2 strings, and Line of fire describing Paddy’s contribution as “Guitar twanging”, it’s clear from listening to Line of Fire that Paddy can actually play all 6 strings on his guitar – and is actually good at it. Rumours that the rest of Lawnmower Deth have insisted he gets very drunk before Lawnmower Deth gigs to ensure that he doesn’t accidentally play properly are as yet unconfirmed. OK that’s the silliness out of the way, now let’s get down to business and talk about the EP. Well, even before listening to it, first impressions are good – it’s nicely packaged and the CD itself looks great. Things like that shouldn’t really matter, but those first impressions do count – when you see bands selling CD’s that are in a clear sleeve with the EP details written on the disc in sharpie then it looks amateurish and inevitably you then expect them to have a poor quality recording – quality on the inside should be reflected by quality on the outside. Now on to the music. First of all, you get four tracks on the EP, but they aren’t short so the EP clocks in at around 25 minutes which is pretty good going. How to describe them? Well think Down playing a couple of Southern Rock songs and you’re probably in the right sort of area – Metal with a stoner rock feel, mixed with southern rock. It’s great stuff – heavy and powerful but with that slower stoner groove and I have to say I love it and have been listening to the EP a lot ever since I got it.